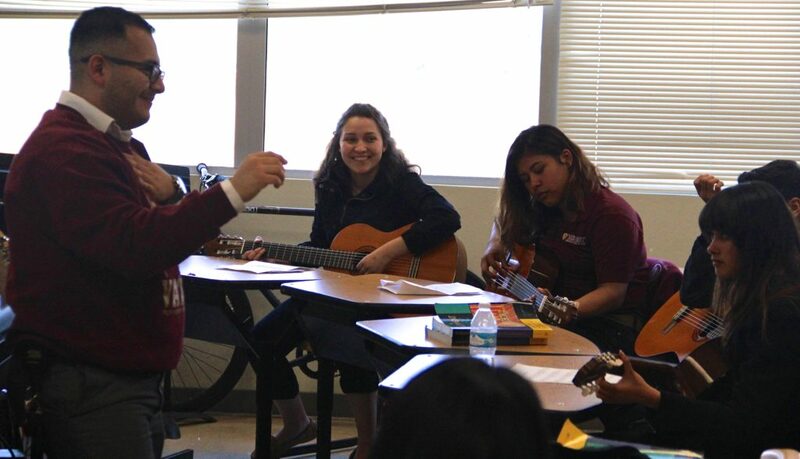 My aim is to give students a meaningful experience and provide quality music education. My Music classroom starts off with a routine of reviewing music theory terms and learning to apply what we learn to the guitar. We make a lot of mistakes, but it is only part of the learning process. Our small and humble school, Valor Academy High School, is located on the fourth floor of Panorama High School. Students show up every day at 7:25 am to start the day and some stay until 6:00 pm to talk to their teachers, make up work and practice. Most of my students do not have the means to purchase their own instruments or music supplies, so we are limited to what our budget can afford. I have made it my goal to tap into all possible resources to give my scholars the quality music education they deserve. In our guitar class accidents happen and strings take a daily beating and many of them snap. Students learn to change their own strings, and make sure they take care to not pop them. The pick popper will be used to make picks because they are an item that easily goes missing. The music stands will be used for rehearsal and performances, and will help students maintain a comfortable angle while practicing and performing. These materials will help my students have a more comfortable and quality learning experience. The music stands will be a long-lasting investment that can be used to help future music students at Valor Academy High School as we continue to strive to provide them with an excellent, well-rounded education. To donate to my cause, please see my DonorsChoose project by clicking here. Will you be teaching any other instruments besides the guitar, my student will be going into 10th grade and he has a brand new saxaphone that belonged to my daughter, and was thinking of learning to play it.